We are successfully meeting the varied needs of our patrons by offering a wide gamut of Metal Bar Straightening Machine as per their precise needs. Precision round bar straightening & polishing machines manufactured by Meraj Engineering are of the “two roll, adjustable angle type. These machines are recognized for the potential to precisely straighten ferrous and non-ferrous round bars. 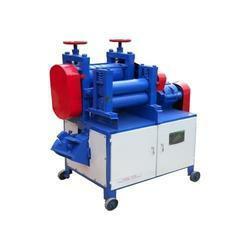 Model ID: SMH-25 Bhambra Engineering Works offers Bar Straightening Machines, SMH Series. SMH-25 and SMH-38 Series of horizontal opposed two roll strengtheners provide of high precision straightening shafts, and out lengths of wire rod and bar from 6mm to 38mm. - Frame: The frame is of heavy construction from M.S. Plates. The Base is so designed to collect and return coolant to the rolls. Bar Straightening & Polishing Machines are manufactured by our vendors' are of the high grade. 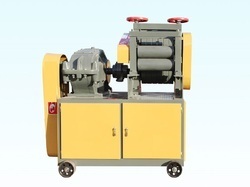 These machines are recognized for the potential to precisely straighten ferrous and non-ferrous round bars. Technical Specifications As Per Their Requirements.